People ask me every day – What is an Exotic Shorthair? Now we are officially supposed to be calling them simply “Exotic” for the name of the breed. I can certainly see why this is confusing to people! Exotics are bred to follow the same exact breed standard as the Persian cat, but with one distinct exception – the coat. Now, not to confuse people even more – but the Exotic also comes in a longhair variety as well. This is a biproduct of the breeding practices. To maintain the integrity of the breed, we must breed Persians back into the lines to keep the facial structure sound, and maintain the plush coat. If we don’t, we will eventually revert back to the head shape, eyes, ears, etc. – of the British Shorthair. This is a more muzzle-y looking face, pointy vs. rounded ears, etc. We want the eyes, head and ears to stay very round on the Exotic. We breeders cannot tell for sure if the kittens are actually short haired until they are a few weeks old. Unless of course one of the parent kitties is homozygous for short hair (meaning they can only produce shorthair),only then can we be sure they are all short haired. Homozygous (HZ) breeding cats are not that easy to come by, so we often still produce some long-haired Exotics. These often look exactly the same as Persians, but they do have the shorthair bloodlines obviously. In the CFA show ring, the long-haired Exotics show against the Persians, and are judged against the same show standards. This has caused some controversy in the CFA community. Many people who have worked very hard to keep their Persian lines “pure” are upset about these cats with bloodlines of other breeds being categorized as “Persians” in the show ring. It is always a difficult thing to figure out as new breeds are recognized. I myself, will not do any Persian or Exotic bloodlines with CPC (color point carrier…AKA Siamese or Himalayan, chocolate, etc.) lines, where some breeders actually breed specifically for the CPC Exotics. I guess it is a matter of personal preference, but you can certainly see where this can become an issue. I myself have bred pure Persians for over 40 years, and continue to do so. For me, once it was in my blood (sweat and tears), I could not give it up. Fur is a condiment in my household! I simply love the Exotic breed, so now I do both. From my perspective, I notice that the Exotic kittens are hunting for their mothers’ milk almost immediately after they are born. In my decades of breeding Persians, I often struggled to get Persian kittens nursing. With Exotic kittens, their eyes open faster and they become active earlier and overall, they seem hardier to me. I would imagine that the wider gene pool with the non-Persian lines bred in, they are likely theoretically a healthier breed. I personally notice a decreased newborn kitten mortality rate, and that is definitely a good thing. We also still do genetic testing for diseases like PKD and such. But overall, to me there is little difference between the Persian and Exotic personality. Exotics might be a little more playful, but every kitten is different. They obviously respond to their environment, so we keep our babies very socialized with children, dogs, etc. I encourage you to do research on the breed if you are interested. The CFA website has great information available at http://cfa.org/Breeds/BreedsCJ/Exotic.aspx . So, in conclusion, the Exotic is a perfect family pet, companion, cuddle bug. Once you have one, you are going to want more! 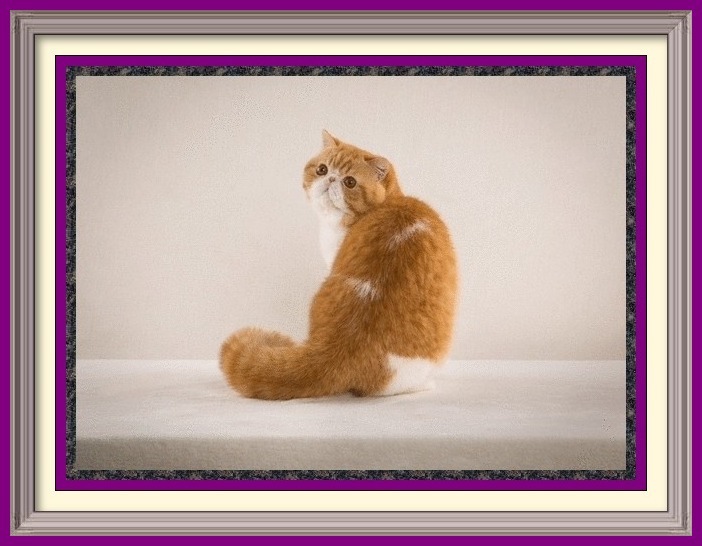 GC Purrtopia Ziggy - "Ziggy" is a prime example of a breed standard Exotic Shorthair cat.